FDM works on an additive principle by laying down material in layers; a plastic filament or metal wire is unwound from a coil and supplies material to produce a part. The technology was developed by S. Scott Crump in the late 1980s and was commercialized in 1990. FDM printers use two kinds of materials, a modeling material, which constitutes the finished object, and a support material, which acts as a scaffolding to support the object as it’s being printed. During printing, these materials take the form of plastic threads, or filaments, which are unwound from a coil and fed through an extrusion nozzle. The nozzle melts the filaments and extrudes them onto a base, sometimes called a build platform or table. Both the nozzle and the base are controlled by a computer that translates the dimensions of an object into X, Y and Z coordinates for the nozzle and base to follow during printing. 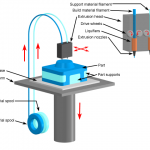 Compared to other 3D printing methods, such as Stereolithography (SLA) or selective laser sintering (SLS), FDM is a fairly slow process. The most common printing material for FDM is acrylonitrile butadiene styrene (ABS), a common thermoplastic that’s used to make many consumer products, from LEGO bricks to whitewater canoes. Along with ABS, some FDM machines also print in other thermoplastics, like Polycarbonate (PC) or Polyetherimide (PEI). Support materials are usually water-soluble wax or brittle thermoplastics, like Polyphenylsulfone (PPSF).